What has Ronaldo achieved in 9 years at Real Madrid? In two words, “a lot”. 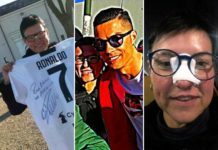 It’s 6 July 2018 and World Football — the media, Madridistas, and especially Cristiano Ronaldo fans — celebrates nine years of Cristiano Ronaldo’s spell at the Santiago Bernabeu. The Manchester United icon landed in the Spanish capital with the number 9 printed on his back. It is believed in Hindu numerology that “9” represents the end of a full cycle. 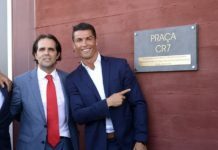 It is complete, perfect, divine; adjectives that suit Cristiano’s journey since he greeted 80,000 fans in the stadium in which he got unveiled on this day, nine years ago. Cristiano began “slowly” with “only” 33 goals from 35 appearances in his debut season for Los Blancos. He played 50+ games in four out of nine seasons and hit 50+ goals per season for six straight years between 2010/11 and 2015/16. CR7 matched a 1 goal per game ratio in 2012-13 with 55 goals in 55 encounters and in the latest campaign with 44 goals in 44 matches. In Europe, the goal-machine has been absolutely phenomenal with a 1.039-goals-per-game ratio. Making the tournament his own, the seven-time UCL topscorer netted his 105th and latest UEFA goal for Madrid when his 98th-minute spot-kick sent Juventus packing in the 2017/18 UEFA Champions League quarter-finals. 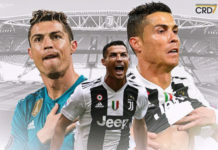 They are way too many to list them all but it is no secret that in nine years at Real Madrid, Cristiano Ronaldo debunked all “second best” claims and elevated himself to cement the number 1 position in awards. And an avalanche of milestones, unique records, and other wins in awards such as the Globe Soccer award. When Cristiano arrived at the Bernabeu, the club was living in the shadow of eternal rivals Barcelona. The latter was dominating both domestically and continentally. 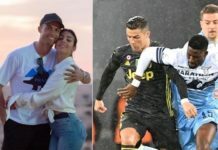 Prioritizing European glory, CR7 paid his dues by inspiring his new side to change the narrative in the UEFA Champions League. In 2014, his extra-time spot-kick against Atletico in the final was the icing on the cake of a record 17 individual Champions League goals to secure the long-awaited Decima. Juventus got the better of Los Blancos the following year, only to go and lose to eventual winners Barcelona. From there, Cristiano and Real Madrid came back into full force. The UCL trophy has unprecedently been exclusively theirs for the past three seasons. With 15* winners’ medals in nine years, the aging star can be proud of his contributions in Spain. He has tasted La Liga twice and on both occasions, he went on to inspire Los Blancos to confirm their authority with Supercopa de Espana triumphs. 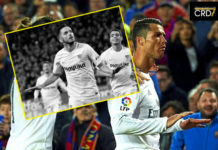 Fans will remember how he confused Pique in the 2012 Spanish Supercup and how his long-range thunderbolt at the Camp Nou crushed Barcelona’s hopes in 2017. Still on the domestic front, Cristiano also had a feel of the Copa del Rey twice. That was in 2010-11 and 2013-14. However, his objective has been to be more than just a local champion. 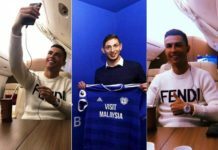 Four UEFA Champions Leagues, two UEFA Super Cups, and three FIFA Club World Cups are the reward of CR7’s desire to make Real Madrid great again in Europe and the world. *Cristiano wasn’t in the 2016 UEFA Super Cup winning squad. Nine-year Real Madrid spell anniversary today; departure tomorrow? It is time for the veteran winger to move on. He has played his part in the objectives of the Spanish giants and will forever be remembered as the greatest in the club’s history. 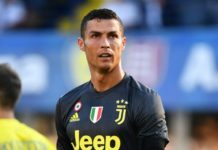 Barcelona-based media outlet, AS, claim that CR7 is 24 hours away from officially becoming a Juventus player. Literally, they mean Ronaldo will be a Bianconeri tomorrow. Until this happens, he remains a Real Madrid man yesterday, today, and forever in the hearts of Madridistas. 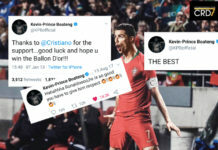 Previous articleWill Ronaldo play in 2018 International Champions Cup?